You won't believe it, on our very first Jeepâ Jamboree we were featured in Jeepâ News (Winter 2000). Our Jeep is the third one from the front, the one with the person standing next to it. Southeastern Utah. The land that time forgot. Where the T-Rex's great-grandfather, allosaurus, ruled supreme. Where countless natural red-rock arches weathered something spectacular. Where Native Americans created mysterious cliffside petroglyphs. Where one-armed Civil War veteran Major Powell explored the Green and Colorado rivers. Where Butch Cassidy and his Wild Bunch eluded the law. Where Zane Grey entranced readers with larger-than-life cowboys. Where Hollywood filmed countless stars for the reel world. Where the discovery of uranium ignited the 20th century's most successful prospecting rush. 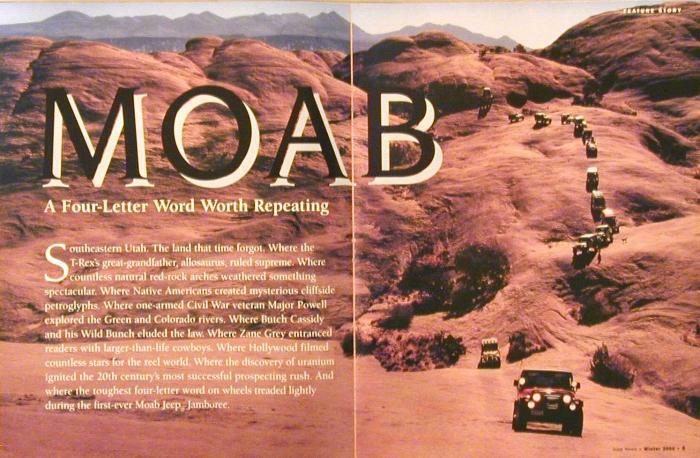 And where the toughest four-letter word on wheels treaded lightly during the first-ever Moab Jeepâ Jamboree.